Global Travel Media » Blog Archive » World Batman Day tomorrow. Let’s celebrate. World Batman Day tomorrow. Let’s celebrate. Whether it’s George Clooney, Ben Affleck, Michael Keaton or Christian Bale – we’re spoilt for choice when thinking about who our favourite Batman character is. One thing we know for sure though is that the Caped Crusader is a cultural icon that we’re happy to celebrate! 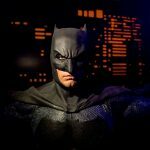 Fans of the Dark Knight can celebrate with Batman himself in the all new Justice League: A Call For Heroes experience at Madame Tussauds Sydney. The epic, new experience unites an all-star cast of DC Super Heroes including the first moving wax figure in Australia, and transports guests to Gotham City on an interactive mission to save the world. 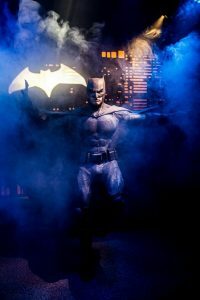 And that’s not all, Madame Tussauds Sydney is offering 50% off entry price to all guests dressed in Batman merchandise on World Batman Day – 15th September. Terms and Conditions: Present this coupon upon entry to Madame Tussauds Sydney to redeem your 50% ticket offer. Not valid with any other offer, group or advanced booking and combination or online saver tickets. Voucher holds no cash value and is not for resale. One promotion code will be accepted per transaction. Only available to be redeemed on walk-up at the admissions desk. Promo code BATMAN | Valid on 15 September 2018.